Stakeholders from Hainan’s tourism industry have reacted positively to recent measures announced by Chinese President Xi Jinping that support the opening up of China’s tropical island province. Senior executives from international brands Mission Hills Group, FC Barcelona, the NBA and Wet’n’Wild, all with a strong presence in Hainan, believe that Government reforms for the province – which include the introduction of free trade, sports betting and visa-free access to tourists from 59 countries – will provide a significant boost to tourism on the island known as ‘China’s Hawaii’. Ken Chu, Chairman and Chief Executive Officer of Mission Hills Group, owner and operator of the luxury Mission Hills Haikou resort said: “With its tropical climate and clean air, Hainan Island is a popular destination for Chinese tourists, attracting 60 million visitors from the mainland in 2017. “The new reforms will further boost the number of international visitors – which last year exceeded 1.1 million, up nearly 50 per cent year on year – especially tourists from those 59 countries, including Australia, Britain, Germany, New Zealand, Russia, Spain and the United States, who can now visit Hainan visa-free for up to 30 days each time. 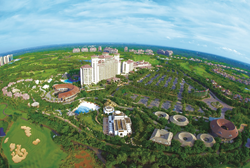 Located close to Hainan’s capital city of Haikou, Mission Hills is recognized by the Guinness World Records as the world’s largest public golf facility, with 10 courses (plus another 12 at its Shenzhen resort), and the world’s largest mineral springs resort (168 mineral springs). The 22-square-kilometre fully-integrated complex also boasts theme parks, movie studios, sports training facilities and sports-themed visitor experiences, developed in collaboration with international brands including FC Barcelona, NBA and Wet’n’Wild. In 2017, Brazilian football legend Ronaldinho was in Hainan to announce the creation of a major FC Barcelona football academy and an interactive football attraction and store at the resort. Five-time NBA champion Kobe Bryant was another sporting superstar to visit Hainan during 2017, to witness the announcement of a first-of-its-kind NBA Destination at Mission Hills Haikou that will include an NBA basketball school plus an NBA interactive experience and store. Earlier this month Hainan’s newest water park, Wet’n’Wild opened at Mission Hills Haikou, surrounded by luxury hotels such as The Ritz-Carlton and The Renaissance. The water park is operated by Village Roadshow Limited, internationally recognized as one of the largest entertainment companies in the world.